The rollout of superfast broadband in Essex has now reached a further 10,000 homes and businesses across the county since our last Programme Update was issued in November and work remains on schedule. It means around 85% of the county now has access to speeds of 24Mbps and above, with it set to increase to 87% by this summer. 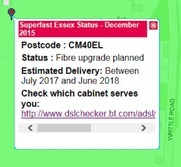 We are in the process of updating the Superfast Essex interactive map to show the latest rollout progress, and hope to have the latest version live by the end of this month. You can also check if your cabinet has been fibre-enabled by checking our live cabinet list on our website which is updated every Friday. The same page also provides a link for you to be able to check which cabinet serves your address if you do not already know. Follow our weekly progress updates on Twitter, Facebook and LinkedIn. Don't forget - nobody is automatically connected to superfast broadband when fibre becomes available, you need to ask your provider to switch to fibre, or buy a fibre service! The Rural Challenge Project in Epping Forest District got off to a good start with the first customers being connected to ultrafast broadband in December, a matter of weeks after engineers started work. Digital Economy Minister, Ed Vaizey, paid a visit to the county to mark the achievement in Moreton village just before Christmas. Work continues on track with two cabinets now installed, and work on a third underway. Almost 25km of trench has been dug to install the Gigaclear network and nearly 300 homes and businesses now have a new fibre connection point installed at the boundary of their property ready to access ultrafast pure fibre broadband. More events are being planned including a Demonstration Event where members of the public can bring along their own devices to see and experience the new connectivity in action. Keep an eye on the Gigaclear 'Events' page and the Superfast Essex 'Events' page for details. Superfast Essex is holding a series of digital workshops to help businesses to stay ahead of competitors and promote themselves online. 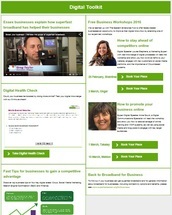 The four workshops, being held in the coming weeks in partnership with Eastern Enterprise Hub, will aim to help businesses make the most of superfast broadband connectivity when it arrives together with a host of information now available in an online digital toolkit on the Superfast Essex website. The toolkit includes a case study film highlighting the benefits superfast broadband has had on a number of Essex businesses, a Digital Health Check, and some downloadable fast tips. Find out more and register to attend one of our business workshops through the 'Digital toolkit' page on the Superfast Essex website. In case you haven't already heard, Superfast Essex and UK Government have launched a Satellite Broadband Scheme to help those with no or slow broadband connectivity access a basic broadband service. Full details including eligibility criteria, instructions on how the scheme works and how to apply, and FAQs are all available at www.superfastessex.org/satellite. If you're in a bright green area on our map, click on the target marker to reveal the annual timescale we expect to reach your area. More defined timescales and the specific cabinets we expect to upgrade will be added once finalised. Great to see yet another positive turnout at our Countywide Parish Engagement Event at the Essex Record Office in December. We will aim to hold these sessions every 6months. We are pleased that our Broadband Champion network is continuing to grow - thank you to the 70 who have already pledged their support. We're always keen to hear from anyone else who would like to get involved. If this is you, read more on our 'Get involved' page, and please get in touch. Businesses and representatives from Essex County Council, Braintree District Council, BT and the Federation of Small Businesses celebrated the broadband coverage achieved to date across Essex business parks at an event at Essex Golf and Country Club, in Earls Colne, last week. More than 140 Essex business parks and industrial areas can now access superfast broadband, with 80 more already planned. Read more here. If you're not covered by our plans, remember (if you haven't already) to register your demand via our survey HERE.